Cover: Silver Palm School House in 1911. We’ve explored in prior articles some of the pioneering communities of Greater Miami, all of which saw their fate change with the entry of Henry M. Flagler’s Florida East Coast Railway into the area in April 1896. While the area on the north bank of the Miami River began developing quickly with the railroad’s entry, the region south of the River remained primarily a wilderness with the exception of Larkins, now known as South Miami, and Cutler. In 1901, the long-anticipated extension of the FEC Railway began when the first train crossed the Miami River with wide consequences for the vast area lying to the south, all the way to the bottom of the Florida peninsula. 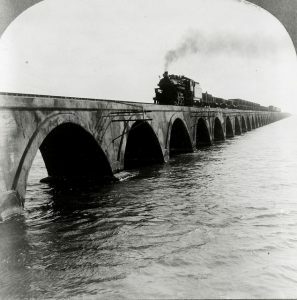 By 1904, the rail had reached the tip of the mainland of southeast Florida where it stopped to catch its breath before beginning an astounding leap through the erection of a series of viaducts across a chain of keys to Key West, arriving in the Island City in 1912. As it proceeded south from the Miami River, the railroad built stations, depots, and sidings at several intervals, and in the process created a series of new communities in South Dade. Silver Palm became the first area in South Dade to comprise “Homestead Country,” a rich farming region stretching from Cutler/Perrine south to Florida City. Later, the term “Redland District” would be used to describe the same area. By 1900, a small number of families had filed claims for homesteads in Silver Palm. Conditions were challenging there for many reasons: mosquitos, isolation, and the long trek for residents to bring goods to and from market along a path carved out of the thick piney woods. Figure 2: Anderson’s Corner in 1911. “Clearing enough land to build a home and put the required area under cultivation to ‘prove up’ (completing the ownership requirements and receiving title to the property), a homestead was a backbreaking task,” recalled on resident. The first stage called for clearing the terrain with its “thick virgin pine forest and scrub palmetto, rock, which had to be grubbed out or leveled off.” There was no heavy equipment available, so clearing was carried out with basic tools, such as crosscut saws, regular axes, grubbing hoes, and pickaxes, along with mules and dynamite. After the trees were felled for clearing a site, they were hauled to a sawmill. The next step entailed the removal of stubborn tree stumps, a task made possible through “shooting dynamite.” Once the trees were cut and shaped into boards, construction commenced on the house. Behind the house stood the outhouse, whose toilets often possessed two holes, one of which was for children. Outhouses usually contained the standard Sears and Roebuck catalog. Some outhouses were also home to hornet nests, spiders, large palmetto bugs, and sometimes even rats and snakes; accordingly, a trip to the facility was uncomfortable at best, especially at nighttime. Next, homesteaders built chicken coops. Then they began digging for water for drinking purposes as well as for an irrigation system that enhanced a soil that lacked richness, because the rock beneath it rested too close to the surface. Soon, with hard work, fertilizers, and good irrigation systems these hardy settlers farmed a wide variety of crops, including tomatoes, beans, and citrus trees. Moreover, Guava trees grew wild in the region, providing housewives with the opportunity of make tasty jelly. Figure 3: Coontie Starch Mill in South Dade. Early families employed makeshift mills to process the root of a cycad plant found in large quantities and which Native Americans in the area called coontie or comptie. The plant yielded, with processing, a starch used in stews, biscuits and breads and represented the area’s chief cash crop, with much of the product shipped to market. Venison and quail were plentiful in the woodlands surrounding the homestead sites. One pioneer experienced trouble keeping deer out of his vegetable garden. Several hardy settlers around 1900 cleared land and built a one-room log schoolhouse, which, upon its opening, became the first school south of Cutler. Initially, the school claimed just nine pupils, or one less than the number required to operate a county-run school. Since there was no age requirement at the time, the community “recruited” a four-year-old as its tenth pupil, thus fulfilling the requirement. Soon after the Dade County School system sent a teacher to the new school. 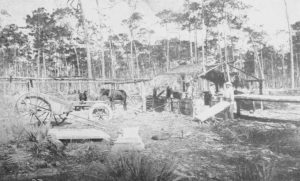 By the early 1900s, then, tiny Silver Palm was exhibiting some of the typical trappings of a frontier community, as its took its place at the forefront of many settlements still to come in deep South Dade. 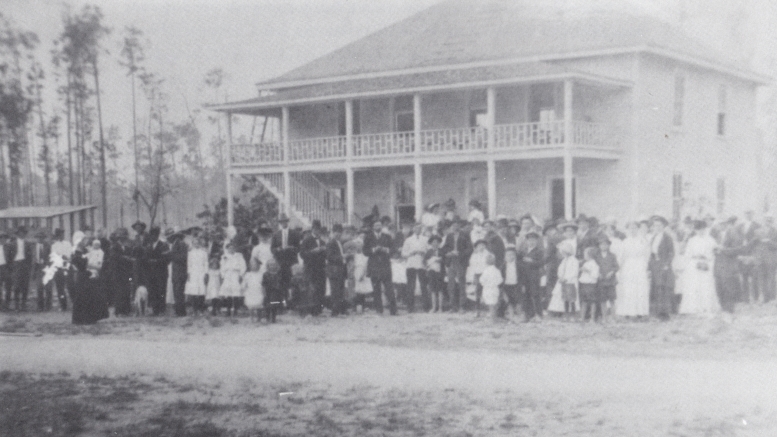 Cover: Silver Palm School House in 1911. Courtesy of HistoryMiami Museum. Figure 1: FEC Oversea Railway to Key West. Courtesy of Florida Memory. 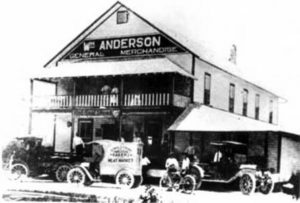 Figure 2: Anderson’s Corner in 1911. Courtesy of Florida Memory. Figure 3: Coontie Starch Mill in South Dade. Courtesy of Florida Memory. Be the first to comment on "Life on the Southeast Florida Frontier"